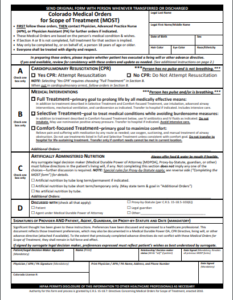 CIVHC is excited to announce that, via partnership with the Colorado Advance Directive Consortium (CADC), we are the new home for the Medical Order Scope of Treatment (MOST) form. A resource for the seriously ill, the MOST form summarizes and consolidates important information about a patient’s preferences for life-sustaining treatments including: CPR, artificial nutrition, and hydration. Colorado legislation (C.R.S. 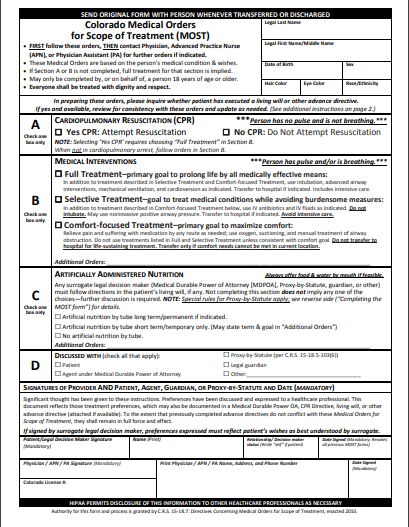 18.7) established the use of the form in 2010 as a variant of the Physician’s Orders for Life-Sustaining Treatment (POLST), pioneered in Oregon in the late 1990s. Many states endorse similar programs and others have programs in development. The MOST form travels with a patient as they move from care setting to care setting and carries the weight of formal medical orders. Providers are required to honor the wishes outlined in the MOST form. Instructions for filling out the form are also included on civhc.org. Part of our Advance Care Planning program, the MOST form is an important resource for stakeholders across the care spectrum. It is an excellent tool to help providers and caregivers have hard conversations and it is a valuable reassurance for patients that their wishes will be carried out. CIVHC convenes an Advance Care Planning Workgroup each month. Please email info@civhc.org for more information.